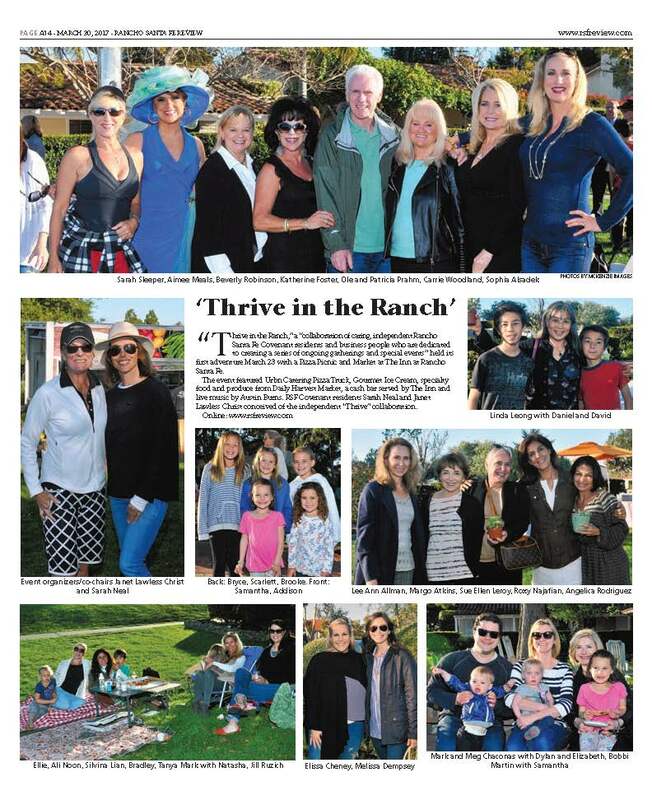 The first “Thrive in The Ranch” event on March 23 was a rousing success in every way! Fun-loving folks of all ages gathered on the front lawn at The Inn at Rancho Santa Fe to partake in a casual gathering that surely made spirits soar and smiles abound! Chaired by Rancho Santa Fe residents Sarah Neal and Janet Lawless Christ, “Thrive” will present an ongoing array of gatherings and special events to enhance community spirit and provide a venue for neighbors to come together! Generous corporate sponsors include Rancho Santa Fe Estate and Fine Jewelry, Pacific Coast Propane, Norma Weiberg of RPM Mortgage, FloodMed, Sage Exterminators, Janet Lawless Christ & Co Residential Realtors, Plantology, US Trust, Charter Flight Group. Attendees could purchase pizza, gelato, farm fresh produce while they enjoyed the acoustic guitar by Austin Burns. The festivities also included a host of games from ping pong to frisbee all while bubbles and joy filled the air! A grand time was had by all. Future dates will be announced shortly!